Arbor Day provides a unique opportunity to highlight the importance of and celebrate the many benefits trees provide to our communities. From capturing stormwater and providing wildlife habitat, to improving public health and adding economic value to neighborhoods, a growing body of research and documentation validates the critical role that a robust urban tree canopy plays in our communities. But in too many places, tree canopies are dwindling and communities are losing out on these critical benefits. This is especially true in urban areas, like the City of Cleveland. Though Cleveland was once nicknamed the Forest City, the city has lost about half of its trees over the past 70 years and continues to lose vital tree canopy – nearly 100 acres each year. Western Reserve Land Conservancy is a proud member of the Cleveland Tree Coalition, a group of more than 30 public, private and community stakeholders that have partnered with the City of Cleveland to rebuild the city’s urban forest. Stakeholders continue to work to achieve the goals established by the Cleveland Tree Plan, a community-wide collaboration to rebuild the urban forest through partnership. Officially adopted in 2016, the plan charges Cleveland Tree Coalition member organizations with various actions to reforest the Forest City. 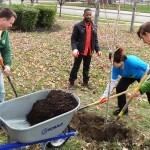 On Earth Day, April 22, Third Federal Foundation, Western Reserve Land Conservancy, and a host of Reforesting Slavic Village partners teamed up to plant 25 robust trees at the Boys & Girls Club in Cleveland’s Slavic Village neighborhood. Special thanks to the Third Federal Foundation for sponsoring the tree planting event as well as a full series of Sherwick Tree Steward Training workshops. Western Reserve Land Conservancy, KeyBank, and Forest City Realty Trust sponsored the distribution of 1,000 tree seedlings at EarthFest, the nation’s longest running Earth Day celebration hosted by Earth Day Coalition, on April 22. Volunteer help was provided by Cuyahoga County Planning, Davis Tree Farm & Nursery, Holden Forests & Gardens, Northeast Ohio Regional Sewer District and the North Face Store. An additional 1,500 tree seedlings were distributed by Cleveland Tree Coalition member organizations at various Arbor Day events. Nearly 150 people attended our Toast to Trees celebration at Nano Brew Cleveland on April 27 to support the Land Conservancy’s urban reforestation efforts. Market Garden Brewery generously sponsored the event and brewed a special tree-themed beer for the occasion, called Root Flare, which sold-out before the end of the night! For the second year in a row, the Land Conservancy teamed up with Mitchell’s Ice Cream to distribute 2,000 complimentary tree seedlings to customers at each of Mitchell’s 8 stores on Arbor Day, April 28. Throughout the day, Land Conservancy staff members and volunteers chatted with customers about the benefits of trees and proper planting techniques. Special thanks to Mitchell’s Ice Cream, JakPrints, and the Northeast Reintegration Center for their support of this event! 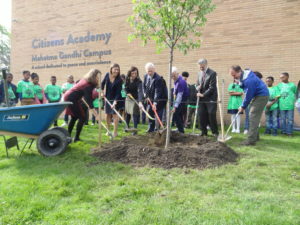 More than 75 community and student volunteers gathered at Breakthrough Schools’ Citizens Academy in Cleveland’s Glenville neighborhood to celebrate Arbor Day, April 28. 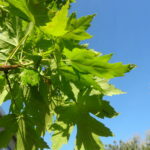 At the event, City of Cleveland Mayor Frank Jackson announced the City of Cleveland’s new tree canopy goal, an important next step in fulfilling Cleveland Tree Plan. The Cleveland Tree Coalition will plant more than 50,000 trees in Cleveland by 2020 and grow Cleveland’s tree canopy from 19 percent to 30 percent by 2040. Read more about the goal in this op-ed submitted by the chairs of the Cleveland Tree Coalition and supported by the Land Conservancy. Ultimately, the Land Conservancy aspires to work with coalition partners to grow Cleveland’s tree canopy to 40 percent. After the announcement, 25 fifth-grade students – alongside Breakthrough Schools staff and volunteers, and Cleveland Tree Coalition members – planted 15 robust trees on the school campus. The event was generously sponsored by Northeast Ohio Regional Sewer District and Eaton Corporation, as well as Sherwin-Williams and Westfield Insurance. Volunteer and equipment support from Breakthrough Schools, City of Cleveland Office of Sustainability, Holden Forests & Gardens, and Davey Tree were critical to the successful tree planting. Celebrating Arbor Day with Mitchell's! 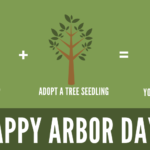 Celebrate Arbor Day with the Land Conservancy!